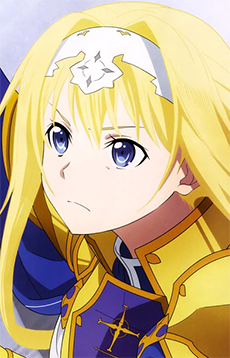 The heroine of Sword Art Online's fourth story arc, Alicization. She is a childhood friend of Kirito and Eugeo. 11 years ago, she broke a taboo in the Taboo Index by entering the Dark Territory by accident, and was later captured by an Integrity Knight of the Axiom Church, the entity that rules the Human World. She later returned as "Alice Synthesis Thirty", devoid of memories before her capture, to arrest Kirito and Eugeo, both who have violated a taboo. She is the very first bottom-up AI developed in the real world, created by RATH, and also the object of interest of the American military.